We are Neil and Deb owners of Lakeshore Vermont in Colchester Vermont. Neil grew up in South Hero Vermont which is 20 minutes north in the Champlain Islands. I, Deb, grew up in Southern Vermont. Saxtons River area. While I was attending The University of Vermont Neil and I met Downtown Burlington. Twenty-two years later we are still on our adventures together. We live about a mile down the road from Lakeshore Vermont on Marble Island Road. We have two sons, Carter and Sawyer and a Jack Russel Terrier Olive. Our son Carter is married to a lovely young lady, Dorothy and they have a beautiful baby girl. Sawyer is a snowboarder and travels often. We personally do all the work and cleaning at Lakeshore Vermont for the time being. Lakeshore was a home which we purchased years ago from a wonderful family that lived there for 30 years. The property is zoned commercial, which left us wondering the best use for the property. Lakeshore is a one of a kind place on Lake Champlain so the only logical thing to do with the property was to make it a place where people near and far could enjoy. Shower and tub. Wonderful Vermont wood counter tops with bowl sinks. Spectacular beach view from everywhere and view of famous Green Mountain views too. Private 100ft sandy beach with each suite. Lakeshore Vermont has the most wonderful view of Lake Champlain and the Green Mountains. Beautiful views of Lake Champlain right in Malletts Bay in Colchester, Vermont. Lakeshore Vermont is located in the heart of the Bay. Lush view of Green Mountains. Lakeshore Vermont there is a 200 foot dock to see all of the lake. The view of Lake Champlain and the lush Green Mountains. 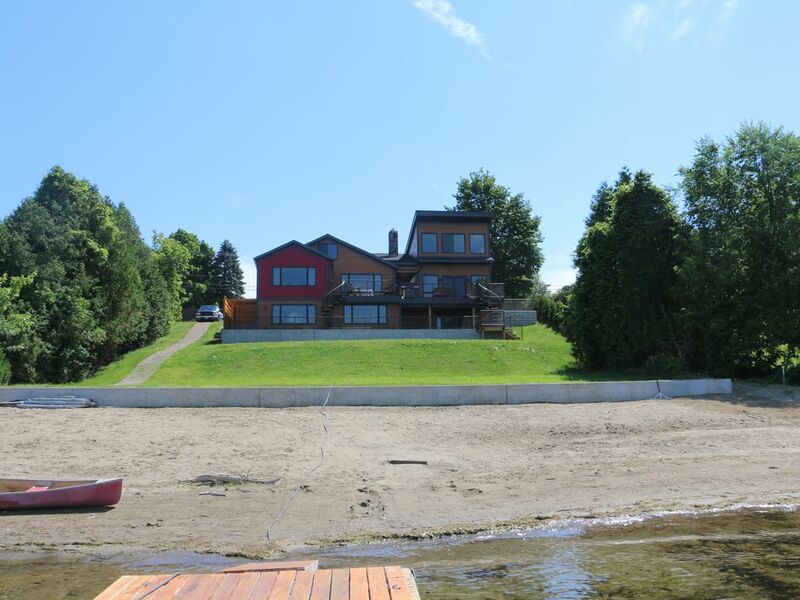 Lakeshore Vermont is right on Malletts Bay water front. All suites have central air. All suites have own control of heat needs. In each suite there is internet access and they have wife internet . Each suite has large screen tv's with cable. We do not provide computer or laptops. Bring one if wanted. We don't supply bicycles but there is a place .5 mile away who rents them. Bike path is just across the street. With Lakeshore Vermont, we have a 200ft dock for boaters to dock. One mile away to put boat in water and we have trailer storage off sight. Tennis is in walking distance (2mins.) across the street. Four courts. My wife and I thoroughly enjoyed our stay. The condo was nicely updated and had more than enough room plus a great shower. The views of the lake from the condo were great too. Even though we had less than ideal weather for most days, the place and surrounding around area make us want to come back. An amazing place that has a nice fireplace, deck with a lake view and easy access to the beach. This place was among the best I’ve ever stayed at. The fireplace, deck, grill, and beach were incredible. It’s perfect for a couple or two. For someone who is skeptical of some rentals, this place is worth every penny trust me. This is a wonderful property! So comfortable and cozy! The views are spectacular, the furnishings are beautiful and the convenience of its location cannot be beat. We will definitely be returning! Lakeshore was a welcome respite in the middle of a 10 day fall color road trip. It was perfect in every way, inviting relaxation and comfort throughout the home. Neil and Deb thought of everything to make your stay a memorable one! We absolutely loved our stay here! It was a busier road than we had anticipated, but once you got inside the views made you completely forget about everything! The house was beautifully decorated, remarkably clean, and pretty much perfect. We would absolutely stay here again! Welcome to Lakeshore Vermont: When staying here you will find a 100ft sandy beach right on Lake Champlain in Malletts Bay in Colchester, Vermont. We also have a 200ft. dock for boaters with 4 moorings. There are three one bedroom suites, king size beds and sleeper sofa in each suite. Each suite is rented separately or all suites can be rented together. Pricing is for one suite. If renting all three suites is nightly rate X3. Spectacular views of Lake Champlain and the Green Mountains. Full kitchens, soaker tubs in each suite. Wood flooring, lofts, large windows, giant porches with sitting furniture areas. Walking distance to Bayside Park with public tennis courts, volleyball nets, skateboard park, playground, excess to bike paths which can take biker to the Champlain Islands with a short bike ferry ride. The best part of staying here is that you have your own beach to enjoy and play. Lakeshore Vermont is only 13 miles from Downtown Burlington's beautiful Church Street and wonderful restaurants. Sightseeing, shopping and eating are right at your finger tips. With many ski areas within a short car ride you get to come back to a delightful comfy home after a day at the mountain.